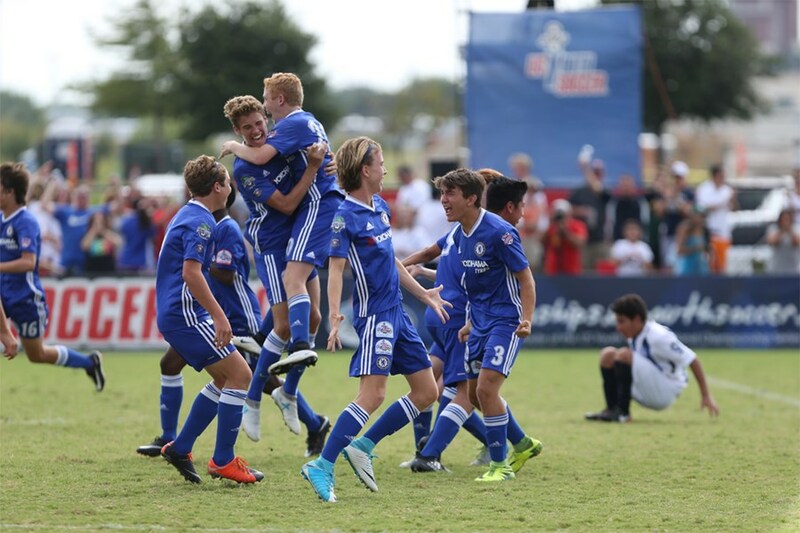 FRISCO, Texas (July 30, 2017) — The remaining champions were crowned Sunday at the 2017 US Youth Soccer National Championships at the Toyota Soccer Center in Frisco, Texas. The country’s top teams in the 15U through 19/20 Boys and Girls age groups met to conclude the final stage of the 2017 US Youth Soccer National Championship Series. Sunday’s final matchups featured teams who earned the right to play for their respective National titles through success in group play and victories in their semifinal games. 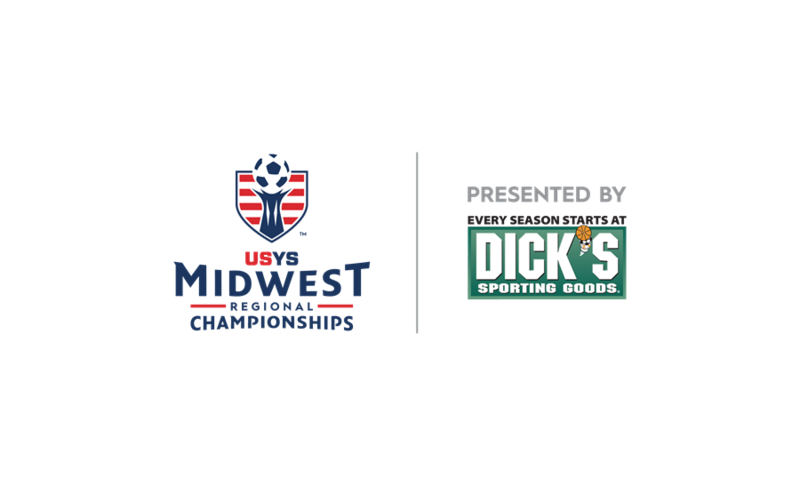 Nationals Union (MI) was the lone club to capture two National Championships, as its 15U Girls and 16U Girls sides lifted trophies on Sunday. The victories marked the third straight National title for several players on both teams who were members of the back-to-back champion PSG MI Gators 02 Orange (MI) in 2015 and 2016. Nationals Union coach Jeremy Harkins said he was thrilled to have both teams who earned the chance to enjoy winning National Championships this year in Frisco. While Nationals Union defended its title, 17U Girls CUP 00 Gold (OH-S) defeated 2016 National Champion Midwest United FC 00 Royal (MI) in kicks from the mark for an overall 1-0 win. As the final game served as a rematch of the 2016 National Championship match, this was a familiar yet tough matchup for the two sides. On Saturday night, the 13U and 14U Boys and Girls age groups played their final matches. A complete recap of last night’s games is available here. Game replays, stories, photos and videos are available following games at http://championships.usyouthsoccer.org. Several members of Nationals Union 02 Black (MI) lifted their third straight National Championship trophy on Sunday, as the Michigan side defeated CUP 02 Gold (OH-S), 2-1, in the 15U Girls final. After a scoreless first half, CUP grabbed an advantage in the 42nd minute. A corner kick to the back post was punched out by Nationals Union keeper Gabriela Green, and Lauren Bastian hammered a half-volley in to put the Ohio South side in front. Nationals Union equalized in the 53rd minute when Caitlin O'Malley sent in a cross from the right wing that floated to the back post, where Meike Ingles directed it in to level the score at 1-1. Emily Matthews, who earned Best XI honors while winning titles in 2015 and 2016, provided the game-winner later in the half. Matthews hit a left-footed strike from the top of the box that flew into the right upper-90 to put her side in front. Green denied U.S. 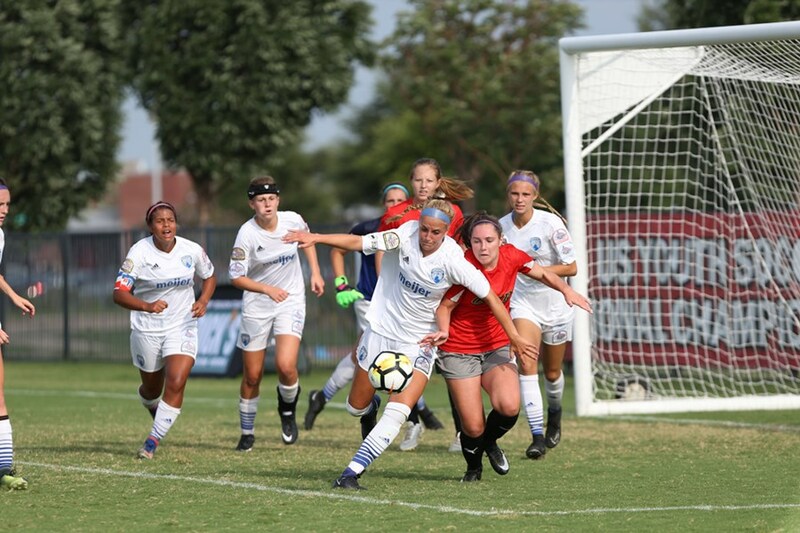 Youth National Team forward Kailyn Dudukovich in the 72nd minute, as she pushed a shot just wide of the post, which sealed the 2-1 Nationals Union victory. Nationals Union coach Jeremy Harkins said the players — several of whom captured their third straight title — managed to come up with the winning plays all season. 16U Girls Nationals Union 01 Black (MI) became three-time National Champions after defeating Legends FC 01 Academy (CA-S), 5-0. Nationals Union came out of the gates early as a combination play led to a cross from the right flank for Madison Medalle to head the ball in. The second goal came later in the first half as Morgan Reitano picked up a bouncing ball in the 18-yard box and put the ball in the back of the net with her right-footed shot. Madison Medalle tallied two more goals within two minutes from each other in the second half to complete her hat trick. Medalle’s second goal took place when Marcella Clark found her on the right side of the 18-yard box, allowing Medalle to slip the ball past the goalkeeper. Nationals Union’s fourth goal came as Medalle tackled a Legends defender, where Paige Webber then took the ball, drew the keeper out and played for Medalle to bury into the net. Nationals Union topped off the win with a Webber goal as her shot from 20-yards out sailed just under the crossbar. In a rematch of last year’s final, CUP 00 Gold (OH-S) reversed the script and claimed the 17U Girls National Championship with a 1-0 (5-3 PK) victory over Midwest United FC 00 Royal (MI). Midwest began to take a slight upper hand in the first half, but the CUP back line did well to prevent the Michigan side from getting a clean look at goal. That changed late in the second overtime period. After some back-and-forth action for much of the game, Midwest generated some dangerous shots in the dying minutes of overtime. However, the shots went just wide of either post and the game was decided by kicks from the mark. CUP keeper Mimi Stines came up with the decisive save, and the Ohio South side converted all of its attempts, as it took the shootout, 5-3, to win the club’s first National Championship. For the second straight year, a Tennessee SC (TN) team won the 18U Girls National title. And just like a year ago, Karlie Paschall played a big role. The Duke commit helped TSC Showcase (TN) strike early before the side held on for a 2-1 victory over Arsenal Colorado Academy 99 (CO). Paschall, a defender for the U.S. Under-20 Women’s National Team, made an immediate impact as a forward for Tennessee on Sunday. After assisting on two of her side’s goals in last year’s championship match, Paschall picked up right where she left off in the third minute against Arsenal. She slipped a perfectly weighted through ball between the back two defenders, and Tennessee’s Julie Garst placed her shot just inside the left post to give Tennessee an early 1-0 lead. Less than a minute later, Tennessee doubled its lead when Paschall laced a right-footed shot from just outside the box that went off the keeper’s fingertips and found the left side-netting. However, Arsenal continued the frantic start by pulling a goal back seconds later. Bailey Nemechek stepped up to win a ball at the top of the Tennessee penalty area and struck a shot that flew just under the bar and into the net. Arsenal’s Esther Malers nearly equalized in the 12th minute but saw her shot hit the crossbar. After Paschall went down with an injury early in the second half, the Colorado side continued to create pressure as it pushed for an equalizer. Despite some close calls, the score remained unchanged, and Tennessee held on for the 2-1 victory to claim the 18U Girls title. Tennessee coach Kyle Roelke said it took a full team effort to deal with some bumps and bruises along the path to the championship. 98 CR Academy (NC) took home the 19/20U Girls National Championship title with a 3-0 victory over ASA Coyotes (MD), redeeming itself from the semifinal loss at the 2016 National Championships. While CR Academy maintained a lot of the possession in the beginning, both teams began to generate chances, including shots from ASA’s Hailey Bicknell and Paula Germino-Watnick. CR Academy soon gained a momentum boost when the team earned a penalty kick. Kursten Von Klahr stepped up to the mark and put CR Academy in the lead when she slotted the ball to the bottom right corner. Just two minutes later, CR Academy’s Faith Adams dashed downline with the ball and played a low pass across the goal to find Ashlynn Serepca, who found the back of the net. CR Academy had a couple close chances and nearly increased its lead before the half, yet the North Carolina team continued the offensive push, making it a 3-0 game when Molly McGarry finished her shot from inside the 18-yard box. ASA showed fight to get into the game, but everything seemed to go CR Academy’s way as it went on to claim the National Championship crown. In an incredibly exciting back-and-forth matchup, Solar Chelsea Red 02 Stricker (TX-N) defeated Tuzos Academy 02 (AZ), for the 15U Boys National title. The lone goal of the match was scored by Solar Chelsea’s Brandon Gast in the 57th minute, though there were several chances for both teams. Head Coach Chris Sticker knew that the teams at the National Championships were going to be the best in the country, but he was so confident in his team’s abilities and togetherness, that the dream of being a National Championship never wavered. Winning a National Championship was special for Stricker because he got to share this monumental moment with his son, Skyler. It took all of regulation, but Tampa Bay United (FL) final got the goal it needed to win 1-0 over WCFC Armour 2001 (CA-S) in the 16U Boys National Championship final. Both teams looked for chances early in the first half with Tampa Bay earning a great chance as Brennan Breuer whipped in a cross that found the head of Alejandro Rodriguez. Rodriguez connected well with the chance, but the header went over the top of the bar. Tampa Bay continued to press, and a long ball over the top was closed down quickly by Armour’s Carlos Gonzalez, who raced out to clear with a big boot. Both Tampa Bay and West Coast continued to test each other to look for opportunities to score and the deadlock finally broke in the 79th minute of play. Tampa Bay earned a corner kick, and Robert Soronellas whipped a ball in to find Nicholas Scargle, who rose up above the West Coast defense and knocked in this chance for the game winning goal. Tampa Bay played out the last minute and as the whistle blew all rushed onto the field and into the history books as the 2017 16U Boys National Champions. “We started off the tournament slowly in our first game but have only been getting stronger as we’ve moved forward, said Tampa Bay head coach Kelvin Jones. “Defensively we were very good today, it just took time for us to get going offensively. With 10,000 teams that start the hunt for a National Championship each year in State Cup the feeling of completing the journey as National Champions can feel surreal. Baltimore Celtic SC 2000 (MD) defeated FC Dallas 00 Premier (TX-N), 2-1, to earn the 17U Boys National Championships title. Celtic controlled possession and the number of chances early but couldn’t connect in the final third to take an early lead. Celtic finally broke through and took the lead by creating a chance that wasn’t held by the FC Dallas keeper and then Herson Morales finished the rebound. Celtic continued to pressure and Benjamin Stitz hit a long blast that was parried over the top by FC Dallas’ Trevor Jackson. Celtic increased its advantage midway through the second half as Stitz found Gielen on a back post run with a floated ball. Gielen rose up above his defender and headed the ball back across the goal over Jackson for a 2-0 lead. FC Dallas, now needing two goals to equalize, pressed up the field and saw a great chance from Garrett Baughman miss just left. Baughman continued to lead the charge and took another chance at net as a ball bounced out to the top of the box for Baughman to hit a side volley just wide. FC Dallas scored in the 73rd minute as Marcos Puga headed a corner kick in to cut the lead in half. In a hectic last ten minutes, FC Dallas continued to search for an equalizer, but the Baltimore Celtic defense held strong to claim the 2-1 win. With each team knowing that there is no guarantee to return to the National Championships, each strive to make the moment their own and play the best soccer they can. BRYC 99 Elite (VA) defeated West Coast 99 Wyss (CA-S) for the 18U Boys National Championship title. In just the fourth minute of play, BRYC’s Vinicius Almeida found the back of the net and 14 minutes later, he struck again to make the score 2-0. The remainder of the first half was scoreless, but BRYC picked up where it left off in the 66th minute with a goal from Julien Reininger. Shortly after Reininger’s goal, West Coast Wyss’ Ryan Bishop netted a goal to make the score 3-1. The final goal of the match came in the 90th minute, just before the whistle blew, when Kahlil Dover scored for BRYC. Winning a National Championship seemed far-fetched to a team who hadn’t won state cup until this year. However, through hard work and sacrifice, BRYC was able to achieve something many can only dream of. In order to make it to the National Championships, BRYC’s Head Coach, Brian Welsh, said that the team stayed fit, had regular double sessions and kept its incredible team spirit. Challenger Crew Jrs Gold 98 (OH-N) defeated West Coast Haney (CA-S) 4-0 to claim the 19/20U James P. McGuire Cup. West Coach started off strong, creating chances but not able to claim an advantage on the scoreboard. Challenger started to settle in and had a great chance as Vincent Worner got around the edge and hit the ball across, but the tough angled shot was saved by West Coast’s keeper. Challenger continued to pressure and had its best chance of the first half saved off the line by West Coast defender Brett Haney. Crew’s Hayden Parente ripped a shot and forced a great fingertip save onto the crossbar by West Coast’s Jacob Huber. West Coast went down to 10 men and Challenger continued to push, finally breaking the deadlock on a penalty kick. Chris Brennan stepped up and finished his chance to give his team a 1-0 lead. Brennan doubled the advantage just three minutes later, receiving a long ball off his shoulder then took another touch to set him up for his shot and buried his chance. A one-man advantage turned into two, and Challenger didn’t look back. Hayden Parente scored in the 67th minute, making a back post run and finishing his chance and then again in the 83rd finishing a spilled rebound. With the win, Challenger Crew Jrs Gold 98 claimed the 19/20 National Championship title and will have its name etched on the oldest trophy in youth sports, the James P. McGuire Cup. To win a National title has always been a long term goal for this team, and they achieved it in its last year together. “This team has been together since they were about nine or ten and guys come and go, but our core group has always stuck together,” said Challenger Crew head coach Oliver Condell. “This has been years in the making and it’s hard to put the feeling after that final whistle into words. 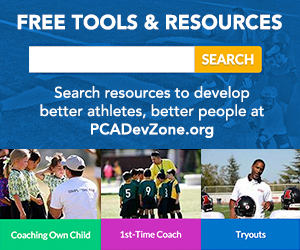 If you’re in youth soccer, this is what you work for—to be at the pinnacle of youth soccer." The National Champions emerged on top in the tournament, which featured US Youth Soccer Regional Champions in the 13U through 19/20U Boys and Girls age groups, as well as the US Youth Soccer National League qualifiers in the 15U through 19/20U Boys and Girls age groups to complete the field of 96 teams. Relive the moments from the US Youth Soccer National Championship Series on Twitter and share the experiences with us on Facebook and Instagram.